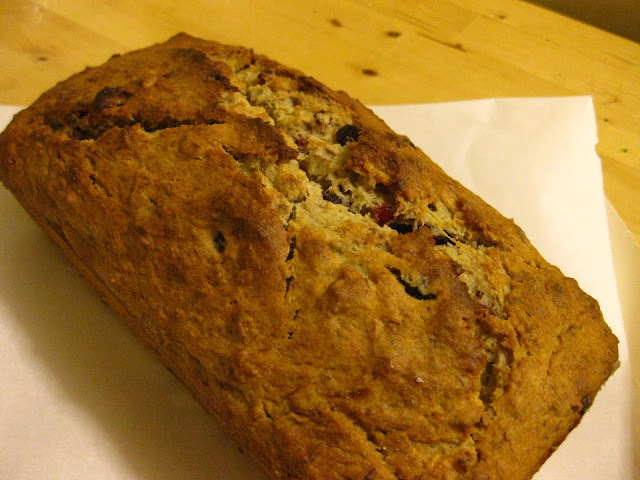 Growing up, my mom always made us the best banana bread (it was just banana bread back then, because I hated walnuts). Her recipe was from a Better Homes & Garden cookbook and had a little gold star sticker marking the recipe. Now that I'm all growed up, I use the Joy of Cooking and add lots of walnuts! 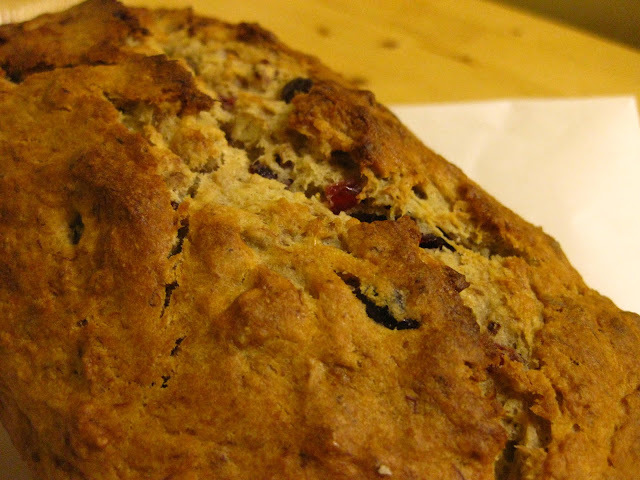 This time around, I added dried cranberries and substituted in some whole wheat flour and applesauce, trying to be heathful-like. 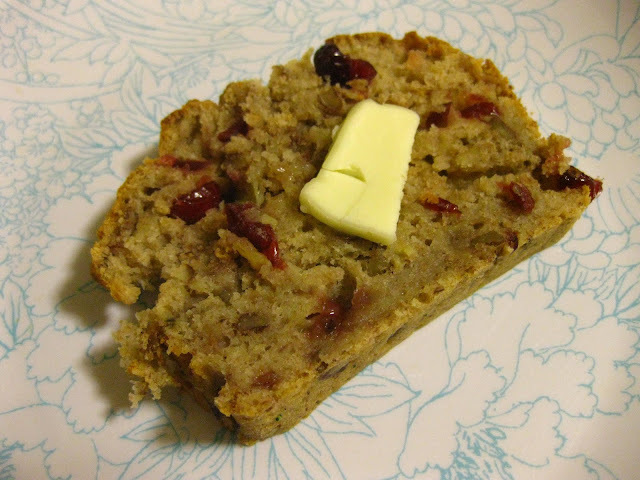 This particular version of banana nut bread came out a little moist and tart. I definitely cut back on the sugar and added a lot of banana and applesauce. I like that you can play around with the additions in this recipe, and always get a different (but delicious) final product. Preheat oven to 350 degrees F. In a small bowl, whisk together flour, salt, and baking powder. In a larger bowl, beat together butter and sugar until creamy. Add eggs one at a time and bananas and continue beating. Add dry ingredients to wet mixture in three parts, incorporating completely until adding more. Fold in nuts and dried fruit. Pour into a greased loaf pan, and bake for 1 hour or until a toothpick inserted into the center comes out clean. Cool slightly and then turn out onto a cooling rack to cool completely. This sounds really good. Glad to hear you love walnuts now! this is now what I want for breakfast! too bad it's not here! Wonder if your mom would make some for me as I am in driving distance to her kitchen, but sadly, not yours. I'm trying this bread next. Got plenty cranberries! Would you consider baking mini-pies in little jars, and letting us know what that's like? Mmmm I really like banana bread as of recently. So good when I have tons of gross looking bananas! I like how you upped the healthiness of it KT! Sounds SO SO SO good! I want to try making this recipe Gluten Free! !